Mistakes happen. So why don’t more movies leave them in? Mistakes don’t generally play a big role in movies. The reason for that is simple enough: If a mistake is made, and someone sees it happen, they just shoot another take. (The IMDB “goofs” section is full of mistakes nobody noticed on set, many involving accidental reflections of the crew in windows or mirrors.) Unless they’re running out of time for some reason—the sun is setting, maybe, or they only have the location for so long—there’s no reason not to do it again and again until it’s as close to perfection as the filmmakers can achieve. That’s a big part of the reason why the narrators of the recent documentary Room 237 are convinced that apparent continuity errors in The Shining are actually carefully planted clues: Stanley Kubrick was known for obsessively shooting endless takes, they reason, so how could he let such a thing slip through? Personally, I treasure mistakes, and wish more directors were relaxed enough not to worry about them. Obviously, some are disruptive or damaging enough to render the take useless—most of the dialogue flubs seen in blooper reels fall into this category (though it’s certainly possible for an actor to transform a momentarily forgotten line into what looks like intentional rumination). But other mistakes are unimportant in the grand scheme of things, and the spontaneity they inject into a scene that’s been carefully blocked and rehearsed can provide a much-needed shot of energy. How often do you see a character drop or fumble with something when doing so isn’t clearly an action written into the script? To get an idea of what that looks like, watch this otherwise purely expository scene from Frank Capra’s Mr. Deeds Goes To Town, in which Jean Arthur’s attempts to practice sleight-of-hand go memorably awry. 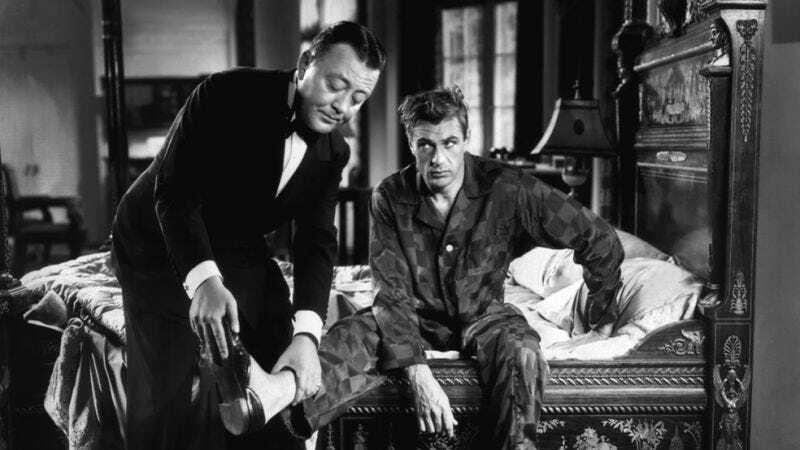 For those who haven’t seen the movie (and also skipped the Adam Sandler remake, in which Winona Ryder and Jared Harris played these roles), its plot involves an eccentric small-town bachelor (Gary Cooper, unseen here) who inherits a fortune from a distant relative. In an attempt to get exclusive stories for her paper, ace reporter Babe Bennett (Arthur) poses as a stenographer and allows him to woo her, predictably falling in love with his simple goodness in the process. In this scene, she’s checking in with her editor, MacWade (George Bancroft), to provide some very basic exposition: MacWade reads aloud a couple of Deeds’ exploits, Babe explains that she’s moved into somebody else’s room to protect the alias she’s using, and the audience is reminded that her goal is to score a month’s paid vacation for this plum assignment. But the scene’s primary purpose is simply to briefly show Babe the reporter for a moment, since we’re mostly seeing her pose as Mary the stenographer. It’s structurally necessary, but not exactly memorable. Except for the coin. One of the movie’s ways of establishing that Babe is a smooth operator, ripe to have her cynicism dismantled by Deeds, is to have her constantly working on magic tricks whenever she has nothing else specific to do with her hands. She’s first seen flipping a length of rope around, trying to make a knot appear at the end of it without actually tying one. Here, she’s practicing the disappearing coin routine, and Arthur gets it right the first time, in a believably clumsy way that wouldn’t even fool a child. She then idly tosses the coin in the air, but fails to catch it, having to retrieve it from her chest. Then she tosses it again and loses it entirely. In one of the goofiest moments of the classic Hollywood era, Arthur, without missing a beat in the scripted conversation, proceeds to actually kneel down on the floor, looking to see if the coin perhaps rolled underneath her chair; she nearly vanishes from the frame in the process, which is something you almost never see in movies of this era. (I suspect this would also have been seen as unladylike at the time, though Babe’s already been characterized as one of the boys.) Arthur finally realizes it must be under the seat cushion, retrieves it, sits back down, and the scene continues. Digging around online, I was unable to find an interview with Capra where he talks about his decision to use this “muffed” take in the movie. (In any case, his memory was shaky by the time journalists got actively interested in directors—in the one interview I did find where Capra mentions the coin business, conducted in 1971, he confuses Mr. Deeds Goes To Town with Mr. Smith Goes To Washington, also starring Jean Arthur.) But I’d like to think he recognized that Arthur’s search for the coin injects some useful verisimilitude into a film that’s otherwise pretty stylized and theatrical. Both Arthur and Bancroft are deliberately larger than life, inhabiting familiar archetypes; all of their lines are unmistakably written. Seeing her perform an action that isn’t moving the story forward in any way—that just seems like some random real-life mishap, because that’s exactly what it is—helps with suspension of disbelief. And while I love Arthur forever for getting down on the ground, the scene’s real MVP is arguably Bancroft, who never for an instant registers surprise, amusement, or consternation. He behaves precisely the way someone not performing for a camera would behave: He ignores it. That takes more professionalism than you might think. Film buffs discuss this scene all the time, and some have suggested that Arthur dropping the coin under the seat cushion was deliberately staged. (Capra implies as much in the aforementioned interview—though, again, I’m not inclined to put a lot of faith in that, since he was talking 35 years after the fact and thought the scene was in a different movie.) It’s possible, and there’s at least one bit of supporting evidence: The chair Babe’s sitting in occupies a space in the office that makes no logical sense. Nobody sets up an office so that guests sit at a 45-degree angle two feet wide of their desk. But that seems like a standard compositional cheat, like the unoccupied space nearest the camera in most shots of people at a dinner table. It’s designed to put Bancroft in the upper-left corner of the frame and Arthur in the lower-right corner, which is more dynamic than having them perfectly parallel. My strong impression is that Capra instructed Arthur to do the coin stuff, as a means of providing some visual interest to an expository sequence, and had the sense to recognize a happy accident when he saw one. (David Lynch has been known to do something similar with oddities he finds on his sets—a malfunctioning fluorescent light seen in the Twin Peaks pilot, for example, was actually malfunctioning, and Lynch liked the effect so much that he left it alone and added a line of dialogue in which a minor character apologizes for it.) No matter how rigorously you’ve planned, there’s always room for the real world to intrude.